The national conference of an industry association is a great place to gain knowledge, learn best practices, and network with peers from around the country (or around the world). Most people proclaim their best ROI at live events is directly related to the people they meet. While the keynote speakers and they educational sessions are fantastic, most people find the real power in live events comes from the other attendees. The serendipitous "Hallway Conversations" that occur when we converse with fascinating people (often who are from other parts of the globe) are hard to plan for in advance, but when they happen we realize they are the reason we came to the event. Yet too many people undermine their own chances to connect by hanging around with co-workers and other friends from their home cities. It is not uncommon at large association gatherings for local chapters to have their own private happy hours or all sit together at luncheons. Why would I want to fly to New York to spend two days connected at the hip with my friends from Austin (who I see every month at our chapter meetings)? Especially if being with them is limiting my opportunities to discover the maximum value from being present at the conference? Am I saying you should ignore your friends or be rude? Of course not. But think about what happens at a luncheon if you all sit together -- You meet nobody new. But if ten of you sit at ten different tables, then combined you meet 90 other people. What are the odds that one of those 90 will be AMAZING? (My guess is most of them will be!!!). If you are attending a large destination event with several others from your hometown, together you can make the conference more successful by working together and separately. Have your private happy hour in your home city two weeks before traveling to the meeting. At this happy hour have each person take a minute to share with the group what they hope to accomplish at the national conference. Then get agreement for all to be on the lookout to help others maximize the event. Hanging around together will limit the value you can encounter. Working for each other while meeting new people at the event will give everyone a shot at more success. If you must see each other, plan to get together at non-convention times. A late night drink in the hotel bar or an early morning walk is a great way to spend time with your friends. If you are on the shy or introverted side, then it is okay have one "networking buddy" whom you attend sessions together. But do not be clingy. It is okay to sit at the same table, but leave a few seats between you so both can engage in conversations with people from other cities. The next time you attend a national event, break the trend of needing to always be with your hometown friends. Challenge everyone in your chapter to get out and be ambassadors for your chapter, city or region. You may be surprised how this will impact your experience. When everyone is out talking up your area the other attendees will notice. If you all sit together everyone will notice you as a clique. The people you meet at conferences can open up a whole new world of contacts. A top reason that people claim to attend association events is for the "networking opportunities", and then they stink at making any connections because they are engulfed by those they already know and see regularly at home. Get over the need to fly over several states to visit with your neighbors. 1. Do not stand or sit together at every breakout, meal, happy hour, etc... Go forth and meet new people. 2. Have a local meeting of those who will be present at the national event a few weeks before the conference. Share what each person in your delegation is hoping to accomplish (what they want to learn, who they want to meet, etc..), and then everyone become the extra eyes and ears. 3. Introduce the cool people you meet on site to others from your hometown. You never know when you might the the catalyst for a fantastic connection. 4. If you think your group is getting cliquey, encourage people to branch out and / or invite outsiders to join you. 5. Have a chapter meeting within a month after the event where those who attended share with the information with whole membership. It was only four weeks ago that I highlighted Michael O'Neal and the Solopreneur Hour Podcast here on Cool Things My Friends Do. While I have mentioned people more than once over the past two years (this is week #99), repeats do not usually happen so quickly. However, this is cool...... Michael's podcast hit a major milestone this week (in the world of podcasts): The Solopreneur Hour received over 100,000 downloads in the month of March (and the month is not over). I do not know much about podcasting, but I do listen to several shows, including The Solopreneur Hour. I know from many of the things I do in my own business that finding an audience is difficult. I get excited if 1000 people read a blog post. 100,000 people doing anything is a huge accomplishment, and Michael only launched this podcast in August 2013. Congratulations to Michael O'Neal and The Solopreneur Hour on this milestone. Now, he needs to get to a million downloads a month!!! ****FYI, this is week #99 of "Cool Things My Friend Do". It has been a very cool adventure highlighting others, and has changed me for the better. What cool things do your friends do? Tell the world. Jax and the LBJ High School Tennis Team took 2nd Place in the Del Valle Tennis Tournament. She and her mixed doubles partner played well and came in 3rd overall and got trophies. She loves playing tennis and is very dedicated to being part of her school's team. I am always impressed with her enthusiasm for the sport as I was never much of an athlete. K8 had the chance to attend the LeAnne Rimes concert with a friend and even got to meet Ms. Rimes. They were so excited I heard they did not go to sleep until nearly 2:00 AM as they recounted the great experience. (I especially love the photo with the random lady trying to get a selfie with LeAnn while she poses with the kids). I am pretty sure my children are having better childhood experiences than I had growing up (and my early days were really good). I hope they realize the cool things they are doing and appreciate their journeys. It is fun to watch them both go out and explore the world. "First Timer Receptions" at most conferences come up short of amazing. The true purpose of hosting a special gathering of first year attendees is often forgotten behind the selection of finger-foods and the placement of the bar. In the end these parties are usually not usually exciting for anyone. Opportunities to impact the conference attendee experience are usually found in the simplest places. Those of us in the meetings industry are often seeking ways to reinvent conferences with alternative meeting formats (which can be great), with the hope of delivering something unique and memorable. Sometimes the shaking up of our existing formats can be done with ease and still create that "wow factor" we seek. Several associations have recently asked me about how they can breathe new life into their "First Timer's Reception". This has lead to some of the most fun conversations I have ever had in this business. It is fun to chat with organizers who are excited to try new things. When people have a positive experience at an event they often look for reasons to come back year-over-year. They also tell their friends and encourage them to attend. Getting people excited in year one has a lasting impact. You do not get a second chance to make a first impression. It is more complicated than ever to spur human-to-human engagement at live events (they are often focused away from the event via mobile technology) and this leaves first timers out in the cold. Those who have long-term contacts at an event tend to look up from their phones only long enough to socialize with those they already know. Cliques are a problem in most organizations, and they are the elephant in the room. But when all we can do is throw together newcomers without a plan we are creating new cliques for next year. Brainstorming ideas with your team and vendors is paramount to finding the best options for your event. Vendors, sponsors, and speakers see dozens of events a year (if not hundreds), and can help identify new concepts that can be used in your own agenda. 6 Ideas for the "First Timers Reception"
1. It is not just for "First Timers". There is no reason your reception has to only include the newcomers. When it is positioned for the "First Timers Only" it can give off the vibe of being the "Kids Table" at a family Thanksgiving. By stating that 1st year attendees need a special place to network, it can create false walls within your community. Make the new attendees the stars of the show and invite and engage the more well known members of the conference society to participate. This will undercut the vibe of a hierarchy. If your VIP's behave in away that says "this is important", it will be amazing. If they blow it off to go to the bar with their clique, everyone will know it. 2. Have a speaker. Do not just have anyone address this group. Often a senior staff member or a board member does an "Info 101" session, and rarely are these talks interesting. Instead, get a speaker for the event that can set the tone for the whole conference. Yes, this may cost some money, but "First Timers" are your future, and worth the investment. Another idea is to ask your morning keynote speaker to do an special talk at this event the night before their speech. It should be different from their keynote (but most speakers have several talks). When this is done right it will set up what is to come in the main event and build excitement. Many people enjoy meeting the speakers, and having a smaller intimate party where that is possible will have positive impact. Many speakers will happily add on another talk for little or no additional fee. If your keynoter is not an option, get one of your breakout speakers to be the featured presenter. 3. Host a "Human Library". This idea is becoming a popular alternative style session at events. The idea is that industry experts volunteer to be "checked out" for 15-30 minutes for short conversations. The attendees sign up for these live chats that can be one-to-one or small groups (do not let people sign up in advance, as on-site will encourage an on-time arrival and keep anyone from having priority). 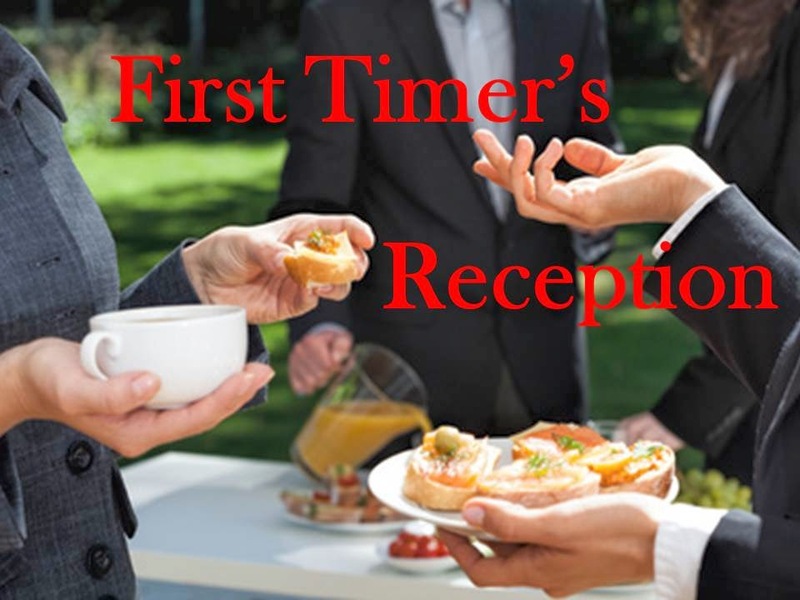 By putting this into the "First Timer's Reception" it creates a special perk for the newcomers, as they get to ask question of the most experienced and influential people in the organization or industry. 4. Provide high-quality and useful gift. Shirts with the conference logo for the first timers sends a message that they are special. People appreciate nice things, but hate the cheap stuff. Be sure if you have a gift that it is not crap. Get a nice Polo shirt or other item that people would want to wear or use after the event. You can even have the people sign up in advance for their size and give them an "opt-out" option so you are not wasting an expensive gift on those who are not interested. 5. Make it an experience. There is no rule that says the "First Timers Reception" has to be in the hotel ballroom or other free conference space. Take them off-site to a local venue that will add to their experience. It does not even have to be a reception. Indoor sky-diving or GoCart racing will be something everyone will always remember. Many organizers cringe at the thought of anything that is not done on the cheap, but if that is your motivation your results will be a direct reflection. 6. Do not host a reception and then forget the First Timers exist. To make the inaugural experience at your conference really special there is more to it than a party. Highlight and honor these new attendees all throughout your event. Make it clear to the whole group that those who are new are the future of the organization and the paramount to the success of the conference. To effectively grow your practice it is not necessary to be over the top with your marketing and advertising. Too often attorneys believe that they must do amazing campaigns that include a large investment of time and money to be successful at branding, and thus to do little or nothing to promote themselves. It is naive to assume that doing good work is enough to attract future clients. Most of your competition does good work, as that is the ticket to entry in the business community. If you want to attract opportunities you have to be known, but this is easier than you might think. Never underestimate the power being interested in others. Being engaged in your community and choosing to pay attention to the people around you will make them feel important. When they feel important (and respected) they will appreciate you. It might sound easy, but it is rare that anyone is made to feel significant these days. The difficult part is that when we get busy, many times we want to shut out the rest of the world to get stuff done. This creates a disconnect, and can undermine your efforts. To market your business you must choose people all the time. Make a commitment to being more present with those around you and you will discover better results. It is simple, but cannot be done without effort. Those who have read my blog for a long time know that I get serious about a commitment for Lent each year. I try to give up something difficult and this requires that I find unusual discipline to succeed. In 2011 I went Vegan. This remains my hardest Lent adventure (until this year). I even wrote a separate blog about the experience, 40 Days Vegan, which continued with a part-time "Vegan Leaning" lifestyle for several months after Lent ended. 2012 came with my giving up all alcohol. This was only hard as SXSW, my wedding anniversary, and St. Partick's day all fell during Lent, but I survived with ease. Processed sugar was my target in 2013. This one was hard because they sneak it into everything (Catsup, etc..).... so while I was not always as successful as I hoped, I did manage a fairly successful Lent sacrifice. This year I decided to go a different direction. Instead of giving up something, I added something difficult that will require sacrifice, dedication and an unparalleled commitment. I joined an early morning fitness bootcamp program. 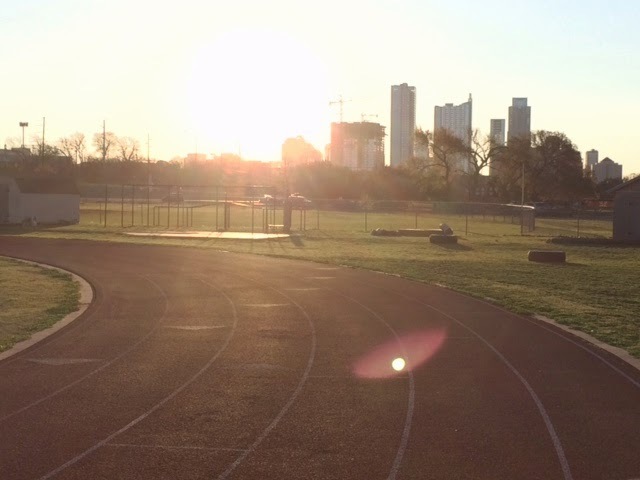 The 7:00 AM class takes place near downtown three days a week, and if I am not traveling, I am present with the trainer, who is working me harder than anything I have ever experienced. Two weeks into Lent (I admit it - I started a few days late because of SXSW) I am doubting the logic behind this choice, but there are moments when I am enjoying this festival of pain. I am sore, exhausted, and feeling the burn in muscles that have never been worked ever.... but I will be back out there next time. Ryan Nail is the owner of Corefit Training in Austin. He has been holding these morning workouts for seven years, and he has a great combination of compassion and Drill Sargent. He works each person in the class based on their level of fitness and experience, but he requires each person to give 100% for the hour they are in his charge. While I have never been much of an athlete, I feel improvement in just a few sessions. Along with my commitment to the workouts is also the dedication to making better food choices. I have been using the My Fitness Pal app on my iPhone since January and tracking all my food and drink choices. It has become like a game to not go over the calorie recommendations, while still eating healthy. Turns out the sweets and other crap we snack on are all wasted calories. The combination of selecting the right foods and exercising (which started before the bootcamp) is already showing in my belt. I look forward to completing my 2 months in the fitness bootcamp for Lent. Heck, I might even stay involved longer. Some in his company find this to be an "unfair" inquiry, but in today's Social Media Crazy World there is no reason someone should not be easily able to provide a good response. Each person who is brought in for interviews at my friend's company receives a list of the executives they will meet a week in advance, but most have no clue how to answer this question. His bio is on the firm's website and he has a robust LinkedIn profile, yet few candidates have ever looked him up before their face-to-face meeting. When going to a meeting of any kind, be prepared. This is not just good advice for job seekers, but also for sales people (and others). Before you meet with someone new, are you looking them up? Why or why not? In advance of any meeting it is useful to read the other person's LinkedIn profile. While many people do not have meaningful information on their profiles (and some do not even have a LinkedIn profile), there are times when the discovery of a mutual connection or knowing career information (where they went to college, business affiliations, etc...) will fast-forward your conversation and relationship. Take a look at my LinkedIn profile.... what did you learn about me? Why would that matter if we were going to have a meeting? Cool Things My Friends Do: Feathr Wins the "Move My Start-Up to Austin Contest"
I met Aidan Augustin at the 2014 South by Southwest Interactive Conference in Austin, TX. Aidan is the co-founder of Feathr, an event management app (company) that is helping to make the human-to-human connections at conferences better. When we met he had just won the Capital Factory's 2nd annual "Move Your Start-up to Austin Contest", and he and his team are currently making plans to relocate from Florida to Texas. As a keynote speaker and "The Conference Catalyst" it gets me excited when anything is introduced that is designed to improve the ROI of live events. While I have not yet seen the details of what Feathr provides, I am looking to spending time with my new friend (and learning about the technology they provide) when he gets to Austin. Capital Factory is a great place for Aidan to bring his young company. Josh Baer and the team at Capital Factory have created a unique environment for start-up entrepreneurs to learn, grown and thrive. I think it is cool that they won this contest, with over $100,000 in cash and prizes that allows the employees at Feathr to come to Austin and become part of our dynamic business scene. Do you believe that humans will augment our bodies with technology? Is resistance futile? Will we be assimilated? My friend Richard MacKinnon is the organizer of a new startup festival, BorgFest, in Austin scheduled for October 2014. 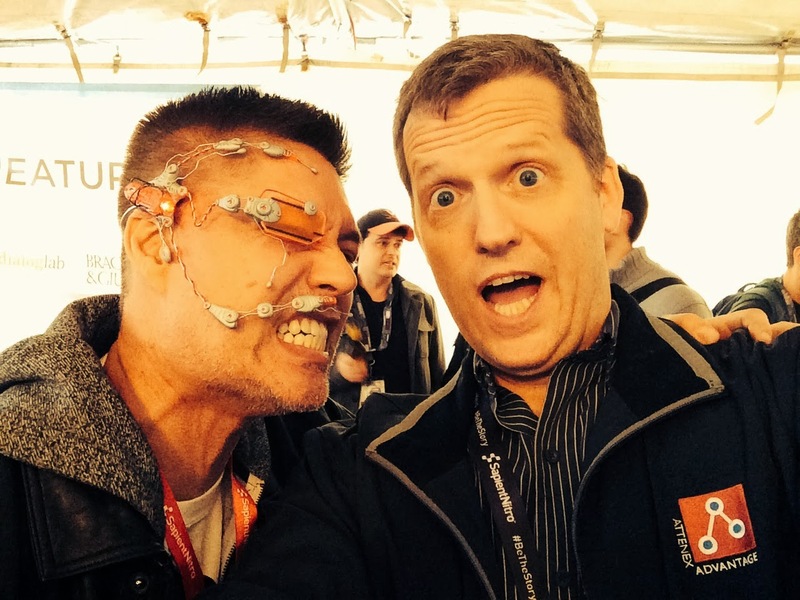 It's a cyborg festival and expo for human augmentation, enhancement, body modification, and wearable tech. In order to make this event special, Richard will focus on the culture and identity aspects of human bodies changed by technological intervention. As we all get older, more and more of our bodies will be replaced or augmented and we will end up drawing attention to ourselves in not always positive ways. How is the human body is changing, as well as our identities? What does it means to be human? Borgfest will bring together people whose bodies and identities have changed (from accidents, war injuries, medical issues, etc...), their families, service providers, vendors, product companies, researchers, and startups that are disrupting the medical device industry with 3D printers and other rapid prototyping and iterating technologies. How can you help today? There is something that you can do RIGHT NOW...and I mean NOW (Until March 15, 2014). Richards needs your vote in the WINSXSW Contest sponsored by VentureBeat and BuzzStarter. I look forward to seeing BorgFest come together. Congrats to Richard on this cool project ("Cool Things My Friends Do" week #96). Lawyers are tenacious when it comes to their work. The definitions of tenacity include; holding fast, highly retentive, and persistent. When trying a case or pouring over documents attorneys have high level of commitment to doing whatever it takes to complete the task. However, when it comes to marketing, branding, networking and business development many are not focused and give up easily when they do not see immediate results. To build a successful practice you must be committed to the long term efforts it takes to raise your visibility in your business community. People do business with those they know, like, and trust... but if you are not participating with the key people who can hire you or refer business, then they are working with other lawyers. To be tenacious in your marketing efforts you must understand and honor the importance these activities have to your future success. If you continue to believe "doing good work" is enough to build a practice then you will find yourself frustrated with the ups and downs of your career, as when you get busy you will forgo the marketing work (while justifying your time spent on billable activities). The most successful lawyers realize that there is more to business than billable hours. Create a plan and identify the activities that will impact to your success, and then do not let anything get in your way. Developing new business is complicated. Many people think networking is just going to "after-hours" events, drinking some beers and waiting for the referrals to role in. Others think marketing is about website and logo design. This is why so many lawyers give up on the whole process. When they do not see fast results they trash the whole concept. To experience marketing success means that you have to be tenacious. Many people you meet can be great connections for you, however it takes a long time to build meaningful relationships. Stick with it. You cannot reach the top by quitting half way up the mountain! The Singer Family would like to say "Thank You" to everyone who supported our 7th Annual February Fundraiser for the "Kate Singer Endowment for Cranio-Facial Research" at the Dell Children's Medical Center. As you may know, Kate (now age 12 and FABULOUS) was born with a medical condition that caused the bones in her skull to prematurely fuse. She underwent major surgery at age 6-months, and today is doing great. Our family donates a portion of the fees I earn as a professional speaker to a research endowment we created at both our local Children's Hospital in Austin and Rady Children's Hospital in San Diego (where Kate had her surgery). Each February we invite our friends, family and others to donate to the cause. Over the years the two endowments have grown to about $40,000 (and we are not going to stop!). Our efforts at fundraising last month topped $2200. Donations from $10 and up all came together and added up to this meaningful amount. (It is not too late to donate... CLICK HERE). Thank you to all who supported the cause in 2014.